Somewhere in a maze of picket fences, golf greens and lakes, Vero Beach’s The Gallery at Windsor is a remote haven for British art world patricians. Its currently two years into a partnership with London’s Royal Academy of Arts, which annually brings a celebrated artist to the Atlantic coastline to exhibit. 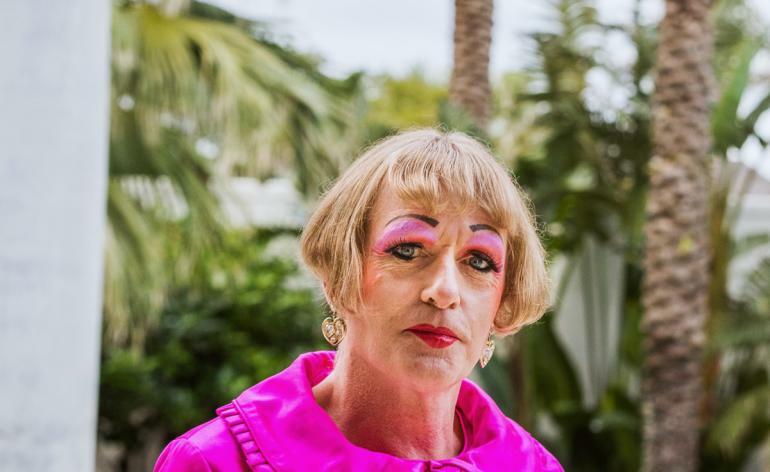 Last year, we observed with interest as Grayson Perry brought his flambouyantly British work to the palatial private community, to the visible delight of its residents. Now it’s the turn of Irish artist Michael Craig-Martin, who saw an equally warm welcome (unseasonably chilly Floridian February withstanding). Despite his connections with the US – Craig-Martin spent much of his childhood in Washington DC, and studied at Yale in the 1960s (more of which later) – he has exhibited relatively narrowly across America. Most recently, his work was included in group exhibitions in New York and Dallas in 2015; but as his stateside exhibitions go, ‘Present Sense’ is a vastly comprehensive one. In fact, it sees the artist’s sculpture, prints and paintings exhibited together for the first time anywhere, offering never-before-seen perspectives on the artist’s unwavering approach to each discipline. Another first, ‘Present Sense’ marks Windsor’s inaugural en plain air display, with Craig-Martin’s sculptures positioned around the manicured grounds. In its 17-year history of hosting world-leading artists (Alex Katz, Peter Doig, Ed Ruscha, Alex Katz, and Jasper Johns to name a few) it’s surprising that the gallery’s vacation-perfect surrounds haven’t been utilised more often. The success of Craig-Martin’s sculptures in their picturesque settings might be set to change that (though one does worry they might get clobbered by a rogue golf buggy, or over-zealous swing). The paper-thin works, almost two-dimensional in profile, describe familiar objects with Craig Martin’s known clarity. A pink stiletto punctures the turf between mansions; a red wheelbarrow frames the paddocks; two open umbrellas look like they’re about to lift off and bounce across the lake. Thanks to each sculpture’s near-transparency, the surroundings play a crucial role in the way they’re seen, and Craig-Martin had ideas for their exact positioning long before they were finally placed. The over-sized white picket-fence, for example, sits at the entrance of the resort, between rows of actual picket-fences, which look comically small in comparison. A giant, magenta pitchfork pierces the ground near a flowerbed, as if God has been gardening. Through these notable alumni, Craig-Martin attended the pioneering exhibitions of the day, learning ‘from minimalists, colour theorists, and pop artists like Andy [Warhol] firsthand.’ Each early inspiration still sings through his work today, through the reduced quality of minimalism, Albers-inspired emphasis on colour interactions, and the depiction of everyday objects favoured by pop artists.